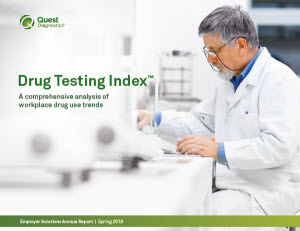 The Quest Diagnostics Drug Testing Index reveals insights into patterns of drug use among the American workforce. Published annually since 1988, the Drug Testing Index examines positivity rates for workplace drugs tested by the company on behalf of employers. We publish these findings as a public service for government, employers, media, and the general public.